Keep an eye on the sky the next time you're at a concert -- a cold beer might be coming your way. It's been announced that attendees of South Africa's OppiKoppi music festival will be able to order beer that comes delivered on an octocopter drone. Called the OppiKoppi beer drone, the device is an 8-propeller helicopter that can be loaded with beer and flown over the festival, arriving at the GPS location of any person who orders a cold brew from a mobile app. Once the drone arrives at its location, it drops its cargo and a single beer attached to a parachute will make its way down to a designated campsite called District 9. With beer intentionally flying in the air, there's some concern about a cold brew randomly hitting festival goers in the head. Darkwing Aerials, the South African company that is providing the beer drone for the festival, says it is taking safety precautions. 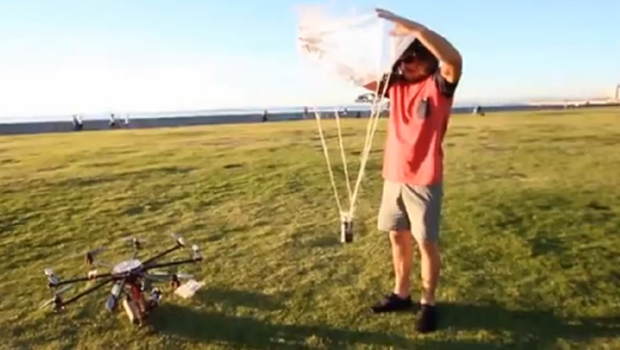 "There's going to be one campsite designated to the beer drop," Darkwing Aerials co-founder Dean Engela told CBSNews.com. "The campsite will be notified that there will be drones in the air." The octocopter will only fly outside of the festival area while it makes its way to District 9 to deliver drinks. The drones are currently hand-guided, but the developers say they will eventually fly on a GPS grid. People who are inside the campsite will be told in advance that a drone will be flying above them during the show. This is the first known case of a drone delivering beer to a festival audience, so there are plenty of kinks to be worked out. One concern is that the wrong person will get delivered a beer without paying for it. Engela says the beer will be provided for promotional purposes and will not cost any money, solving that problem for now. The developers currently have one drone ready for the festival, but are working on perhaps providing two or three for the event. The beer drone currently carries one beer at a time, but Engela says they are working on prototypes that will carry two or three. The OppiKoppi music festival takes place from Aug. 8 to 10 at a farm in Northam, South Africa. Watch a demonstration of the OppiKoppi beer drone in the video below.